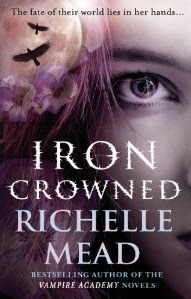 You all know by now I’m a huge fan of Richelle Mead, so I pre-ordered Iron Crowned (the third book in the Dark Swan series) months ago, like last spring. As you can imagine, there were no cover released at that moment. Here are the two covers currently available. Now that I’ve seen those two, I’m really glad I ordered the UK version. I mean what’s with the US version? The model just looks really weird, and the color scheme is just too loud for my taste. And it’s so different from the previous books in the series. Yes the UK cover doesn’t really fit with the previous pattern either, but I think it’s much prettier. I agree I like the UK version better too. I wanna know why does the UK and other countries get such prettier covers? I didn't like the covers of the 1st and 2nd book either, they look too harsh and cheap to me, but I love th new UK cover! It looks sophisticated and elegant! Oh, I would have loved to have this series in this kind of edition for all books.. I really don't like the US cover. Thanks for showing the UK cover because that's the one I want to pre-order. The US one is baaad! The UK cover is definitely my favorite of the two. I agree, the UK cover is better. I prefer the UK covers for the first two books, but I have to say I don't really like either of those covers for this one. I agree with you about the model etc for the US one of Iron Crowned - it's just a little weird, and I think the colours make it really hard to see the title or author name - they don't exactly stand out.